The days get shorter and the cold is moving in. Looks like a good time to take a look at those career break plans and make something happen. If you’re thinking of getting out there and seeing a bit of the world then there is one great option where you can use the skills you have to make a positive impact on others whilst getting to the heart of exciting new cultures at the same time. Consider volunteering abroad on your travels. Not only is it a great way to do something positive in the world, but as a result you will get the opportunity to live and work amongst some unique cultures and see these countries from the inside, instead of just being a tourist. There is a perception that volunteering is the preserve of the gap year student, but more and more career breakers are making it a positive travel option and getting involved. OK, sounds good? But how do you find out what kind of project would be best for you? A good place to start is often to think about the skills and interests you already have and how these could be valuable to people in the developing world. First and foremost, one of the most obvious and valuable skills that office workers have is being able to navigate a computer reasonably competently. Here in the UK, it seems like kids are born with a device in their hands and computer literacy and access are increasingly becoming viewed as basic human rights in the same way as traditional numeracy and literacy. While we take computer literacy for granted, there are many countries where access to computers and developing skills to use them is still unattainable for many. The ability to navigate a computer, open and send emails, present your ideas or more advanced skills can not only improve employability but connect people in developing countries with a world of information and free education on the net. We have all the seen the role that social media played over the summer in the Arab Spring revolutions in countries like Egypt and Libya. If you want to get involved with a computer literacy project, you can head off to South Africa’s spectacular Wild Coast to volunteer on a computer programme which is sponsored by Microsoft. So far this project has developed 130 computer labs, enabled 5 schools and 2 crèches to receive extra hands-on support and has provided 3 schools with Internet access. 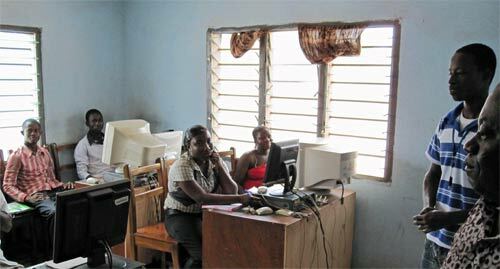 Aside from this around 1,000 learners per week benefit from computer lab work, 130 adults have benefitted from free evening courses and this is all through the help of over 700 volunteers to date. Fancy a different kind of volunteering? If you want to get away from computers for a while, then there are plenty of other options available too. You could join a community-based initiative, such as empowering marginalised slum dwellers in Ghana. This project offers skills training and post skills support to residents from low educational backgrounds, those of low financial status and specially-targeted groups such as those with HIV. Modern developments in treatment can mean that HIV is no longer the death sentence it once was and getting HIV positive people back into society is an essential part of improving their lives and that of their families. As a part of all of this, skills training in areas we take for granted, such as basic financial management, are cornerstones of this skills support programme. Volunteers can assist in micro-finance schemes, organising personal development sessions for trainees in the area of finance, job-searching, and health development, and volunteers have even been taking one-on-one sessions with locals enrolled on the programme. These sessions just cover the basics of planning your weekly spend and the kind of maths we would do in the supermarket every week, but the support is still invaluable. How do I choose a volunteer placement? There are just some ideas for office workers. Consider how projects can benefit from teachers, nurses, web developers – we could go on! But if you want to get out there and make a difference there’s certainly plenty of scope. The best way to ensure that your skills are utilised is to speak to a reputable volunteer company. After hearing your skills and interests they will be able to talk you through what options are available to you and identify what the best fit for you would be. The key to finding the right project is to take your time and do your research. Try and have a chat with the companies you’re enquiring with rather than just communicating via email, it’s much easier to convey what you’re about and what you’re looking for when you’re having a conversation. Once you’ve finished making your enquiries jot down all your options and see which one appeals the most. You could do a list of the pros and cons, or you might find that the ideal project just jumps out at you. If it’s something you’ve been thinking of for a while but you’ve never got round to doing it, don’t put it off any longer – they can still use you in your retirement, but that is one career break that is just too far away to get you through this winter! This article was written for The Career Break Site by Richard James, Placement Advisor at Kaya Responsible Travel. Kaya Responsible Travel specialises in volunteer projects in the developing world and helps match volunteers from all walks of life to the right project for them. Kaya Responsible Travel have been vetted and approved by The Career Break Site. All images on this page are the copyright of Kaya Responsible Travel. For more information visit www.kayavolunteer.com.